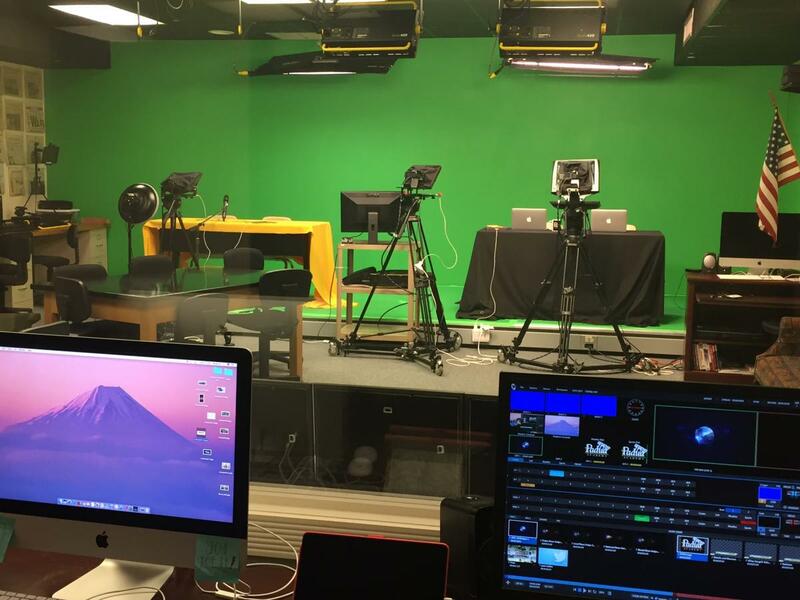 We converted an old classroom into our TV Studio. 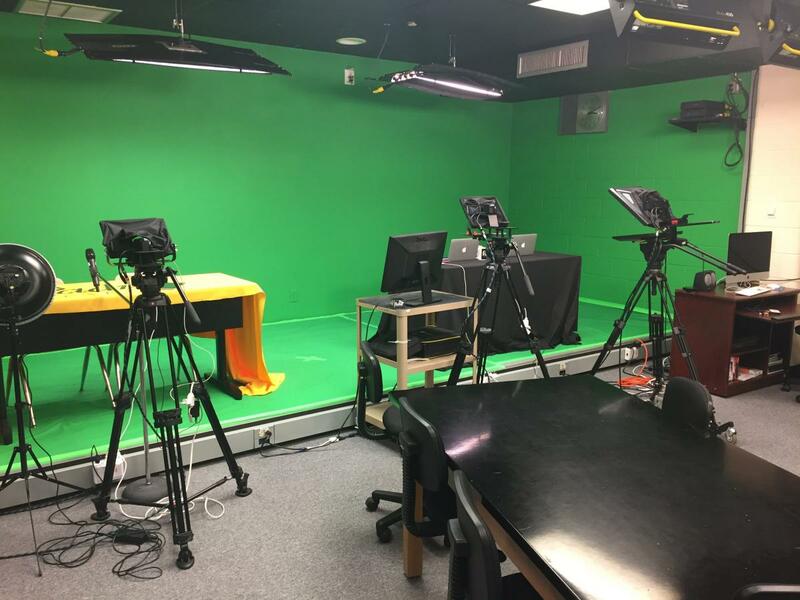 We have a stage for anchor and sports desks, the back wall in green screened so we can do chroma key backgrounds. I have 6 computer work stations and a small control room that we use to run our daily show. I have a closet to store all the equipment. I have two whiteboards, one for each publication, that I use to organize story ideas. I think the best, and worst, aspect of our work space is that everything is contained in one classroom. 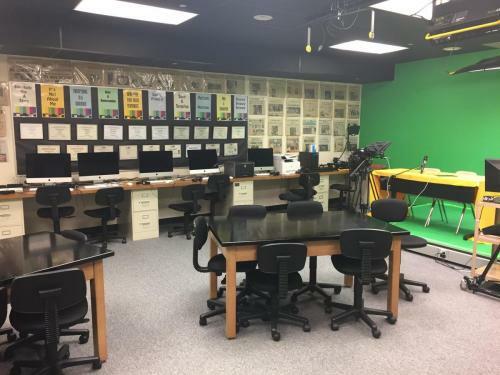 It’s particularly beneficial because the smaller space helps create a much closer classroom. The girls (it’s an all-girls school) become family. That can also be the worst aspect of the small classroom space, sometimes families have disagreements and there is no place to ‘hide’ in the smaller space. 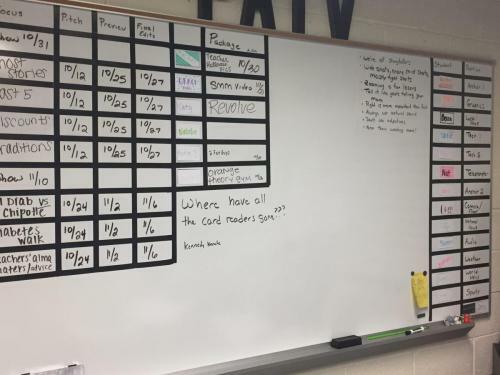 One student said she likes the white boards because it’s easy to see story assignments and deadlines. Another said the tables we have for collaboration instead of desks like a ‘traditional’ classroom. We use GoogleDocs for collaboration on scripts, story assignments, etc. Staff uses Twitter (@padua_patv) and at times Videolicious, Piktochart, Thinklink. Studio Cameras are small Canon Vixia HF R600s. We also use those and for video production. We have two Canon T5’s. My work stations are Apple iMacs complete with the Adobe Suite. 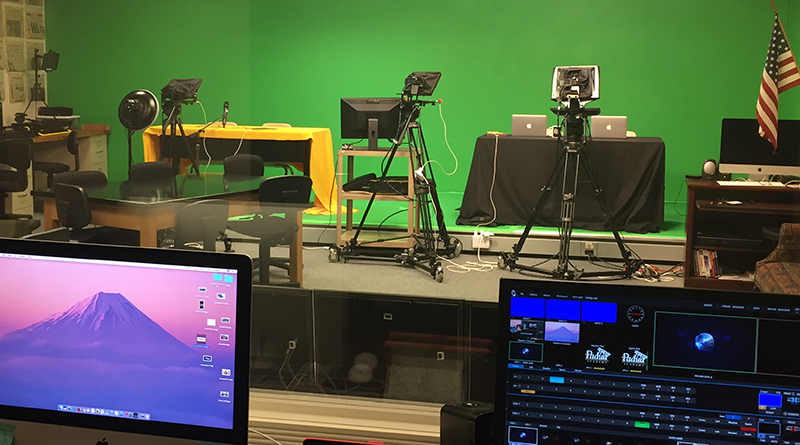 Our daily show is broadcast using a Tricaster Mini. We use Audio-Technica wireless mics for the anchors and sports reporters. I have two iPad teleprompters and a larger Prompter People teleprompter for the Anchor desk. For my intro classes I have several Canon Vixia 300’s so they can learn basic camera use. All students also have a Macbook Air’s. They use those for Photos and iMovie. A good microphone for voice-over work. Audio is so important but often overlooked. For live broadcast – a teleprompter. It gives a much more professional look to the production. 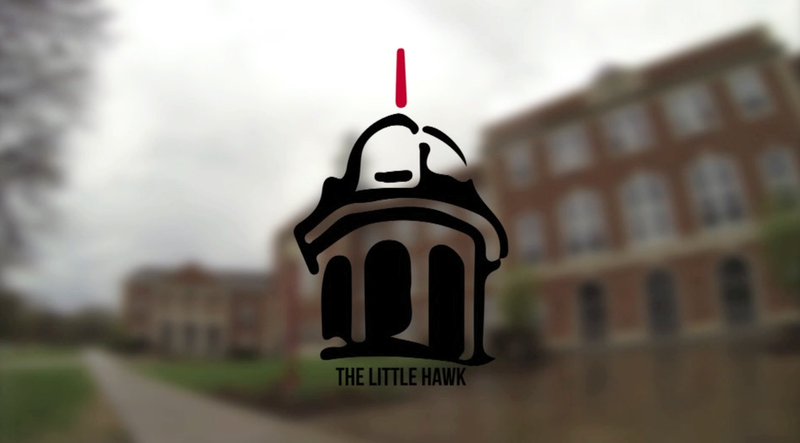 I have a very small budget from my school. We do some advertising but not a significant amount. I’d love a separate audio booth for voice over work.